In continuing with my week of PINK - I thought I would share some fun pink gift ideas. Some of these would be great for Mother's Day. And, I am back with another LINK UP today - Thursday Style Finds. Ooh, so many pretty pink items. Love those dresses! Thanks, Amy. That pink dress I think would be perfect for summer days. I never thought I would be such a pink person. I blame it on the Pantone colors. Loving all of these pieces! I never thought I would be such a pink person either. I need more pink in my closet and I am drooling over those fab shoes! I love those pink espadrilles. Thanks, Alice. Ohh! I'm loving those blush espadrilles! So many pretty shades of pink! I am loving those floral heels! I love every single thing in this post. I might just have to bookmark it for my husband since my birthday/mother's day is coming up! I have a birthday in May, too. I'm all about hot pink accessories - seriously it's all you'll find in my purse! Oh that pink is so much fun. I love it. I am going to have to check out that YSL purse size perfume. I usually use Gucci Guilty Black that I keep in my purse, but maybe I'll mix things up for the warmer season. Sounds like a great plan, Joy. That flamingo is THE cutest thing I've seen!! I know - it is so fun! Thanks, Shauna. I need those sunglasses and those HEELS! Aren't those floral pumps so fun?!? Love those pink espadrilles! Great picks! I know - I am thinking about getting a pair of blush espadrilles. Love splendid espadrilles and the fun key chain! Thanks! I know that key chain is so fun. Love the picks here, Lisa. I also love all the pink you've been sharing lately. Pink used to be so out of my comfort zone - but I am really starting to like it more and more. I want all the purses!!! Me too, especially the tote. Oh, my gravy! Please, please may I have that darling pink purse? If only saying it was as good as getting it. Lovely pieces and that pink is perfect for Mother's Day! Thanks, Leslie - there are so many things I want in this collage. Loving everything! perfect gift ideas for mother's day! I love that you included both bright and soft pink. 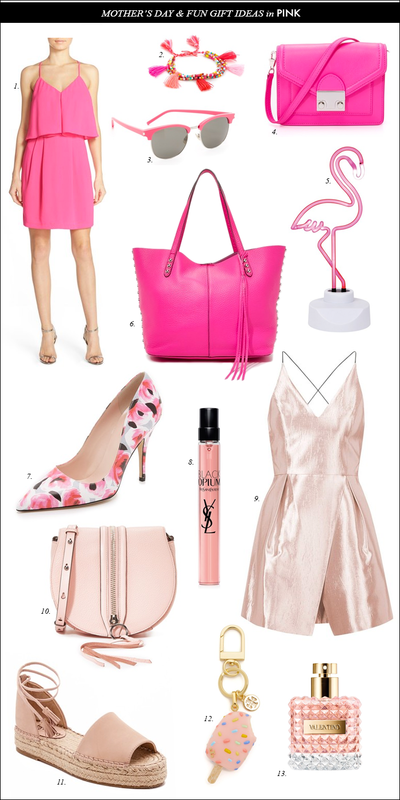 My favourites are the little pink bag and the silky blush dress! Thanks! I love both shades of pink. Love all of these pieces, especially the blush saddlebag and dress! Those floral heels are SO pretty and I love the blush saddle bag! Love that bag!! And wish I had that dress for a party I'm going to tonight!! The floral pumps and saddle bag are my faves! You picked such lovely items!